Bad Breath? | Chris M. Herman D.D.S. Did you know that there are more than 500 species of microorganisms that have been identified in the mouth? With all the bacteria in the human mouth, it is no wonder that about one in four people believe they have halitosis. Bad breath originates from certain oral bacteria producing an abundance of volatile sulfur compounds. 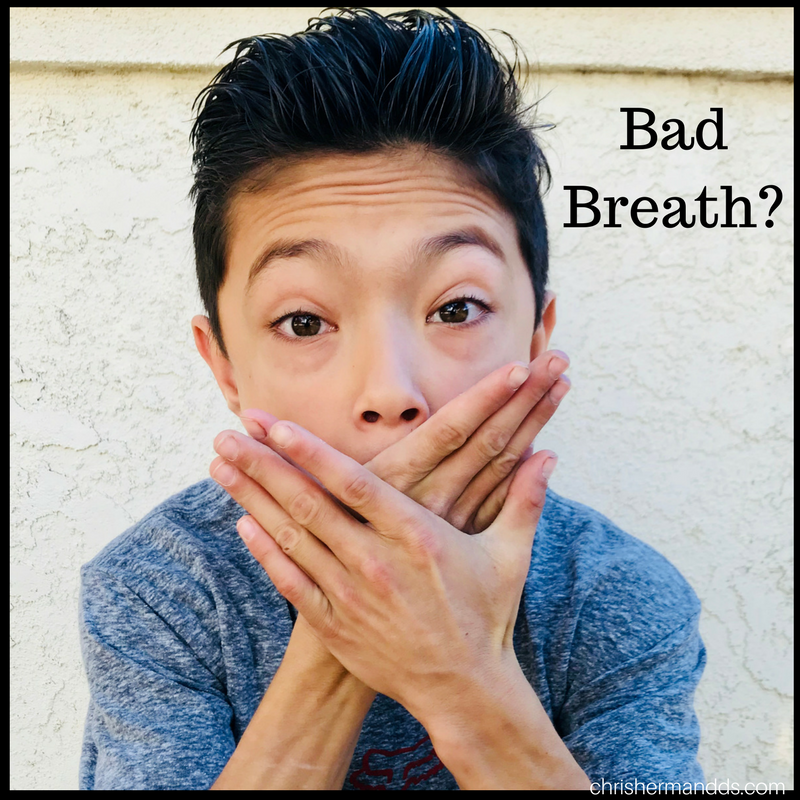 Bad Breath can be caused by several things including certain foods, periodontal disease, rotten teeth, dry mouth, tobacco use, or a medical disorder. ~First, determine if you have bad breath. One method is to take a piece of unwaxed, unflavored dental floss and floss between your upper and lower back molars. Or, use a dry cloth and wipe it across the back part of your tongue for about five seconds. Wait about a half a minute and then smell it. Asking a friend or fa mily member works too. ~Mouthwashes, breath sprays and mints mask the problem temporarily. In fact, mouthwashes with alcohol may further the problem over time, they can dry out the mouth. If you have chronic bad breath, you will ant to get to the source of the problem. ~Be aware of foods that trigger bad breath such as garlic, onions, and coffee. Brush your teeth after consuming milk products, fish, meat, and other food products that cause bad breath. ~Keep your mouth moist by drinking plenty of fluids, chewing sugar-free gum or sucking on sugarless candy. ~Floss, and brush your teeth, gums, and tongue daily. Do not forget to clean behind the back teeth in each row. ~Denture wearers need to avoid plaque buildup under the dentures. Thoroughly clean dentures daily and remove dentures at night to avoid bacteria growth. Denture wearers should continue to see Dr. Herman regularly. ~Talk to Dr. Herman or your periodontitis about oral problems that may be the cause. Dr. Herman can also tell you about the latest techniques to treat bad breath. ~If you determine that chronic bad breath is not from an oral source, see your physician.